Everyone loves to grill burgers and brats but what about bacon and eggs? Breakfast is another occasion to fire up the grill and provides an ideal opportunity to start your summer morning on the right burner. 1. "Prep your breakfast ingredients the night before, so when you wake up, all you have to do is fire up the grill and go!" 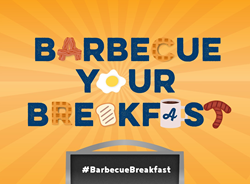 For more information on barbecuing your breakfast, visit http://www.hpba.org. In addition, share a summer selfie of you at the grill as part of our #BarbecueBreakfast contest for a chance to win great prizes. View the contest guidelines.